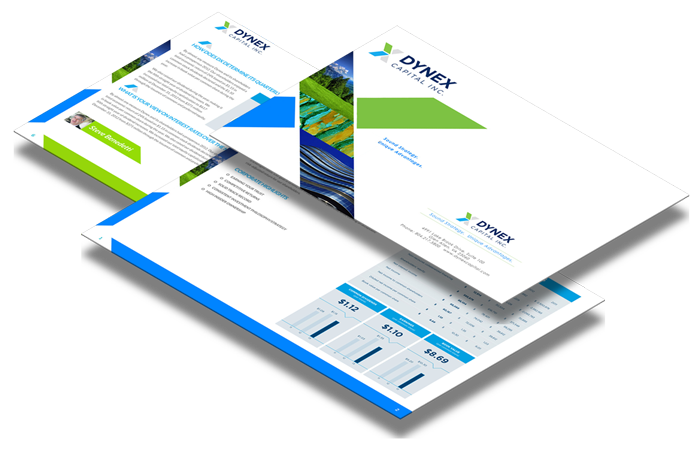 Dynex is an internally managed real estate investment trust, or REIT, which invests in mortgage assets on a leveraged basis. Our goal is to limit risk in our investment portfolio, while earning an acceptable risk-adjusted return for our shareholders. The screen can only capture one dimension of a project. Print has a distinct personal look and feel that can deliver a much bigger impact. These days there are countless ways to connect with your target audience. In the past, the use of print communications was the most dominant and cost effective way to reach potential clients. Just a short time ago, brochures were the main marketing piece used by businesses as a sales tool for distribution at client meetings, conferences, seminars and industry events. Although the web has reduced the need for such a company-wide bound brochure of this type, there are many other effective print marketing options that provide a great deal of flexibility and efficiency for any company. These custom designed “evergreen” marketing folders contain “slip in” sheets that are unbound and can be added or removed depending on the particular client or event. This solution avoids brochures that are rendered useless due to an address or partner change or any other company amendments that would require a costly reprint. Creatively designed brochures can be another effective means of providing potential clients with information about your company or product. The marriage between effective writing and effective graphics that communicate your core message and brand can set you apart from the competition. One thing that has changed today is that a corporate brochure may be requested through your website, or after an initial meeting, often further along the sales process. But since it may be the final piece of information that is put in front of a company CEO when deciding between two vendors, its importance cannot be overlooked. Another seemingly obsolete but still effective marketing tool is through conventional advertising or direct mail. Through creatively designed direct mail pieces, companies can reach their customers via postal mail. These materials include brochures, catalogs, newsletters and sales sheets to name a few. By using effective direct mail design, businesses have the chance to directly engage their consumers by projecting a more personal approach to marketing. This is one of the many different advantages of working with an experienced print communications design team. Our designers are always thinking of new and creative ways of presenting your information concisely, effectively and affordably through print marketing tools such as brochures, sales sheets and direct mail pieces.